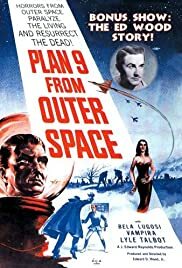 One of the worst movies of all time, Plan 9 from Outer Space, is the next film in the October Fear Fest. I was inspired to watch this after watching the wonderful Ed Wood movie starring Johnny Depp. Part of that story was involving the filming of Plan 9 from Outer Space. And while this is one of the worst films ever, it is also one of the best worst films ever. It is actually quite fun to watch it is so bad. Ed Wood was the infamous director of this film and he was widely known as one of the worst directors ever. He would take one shot and move along no matter what happened. He cast his friends and people he knew. This turned out to be the final film of Bela Legosi’s career and, in fact, he died before filming was over. So, Ed Wood replaced him with his girlfriend’s chiropractor who bared a slight passing resemblance to Legosi. He would have the chiropractor cover his face with the cape whenever he was on screen. Former pro wrestler Tor Johnson was given something that he should never be given in a film…lines. The early lines spoken by Tor were some of the worst delivered lines in the history of movies, right up there with “solar panels” by Alan Bagh in Birdemic: Shock and Terror. Stock footage is used regularly and one scene of Bela Legosi is literally re-used five times during the film, if not more. The film is just horrible, but it can provide a solid unintentional laugh if you understand what kind of film this is. Like The Room, Plan 9 from Outer Space has a cult following that elevates the movie to something more than just a terribly created B-movie. Again, watch the Tim Burton directed Ed Wood before you watch this travesty and it will provide you with more respect for the film than it probably deserves. It is a terrible film, but it may end up on a list of best worst films ever. I’ll do that list some day.